Get in touch for free advice and a quote. Professional Web Design for Glasgow and the UK. 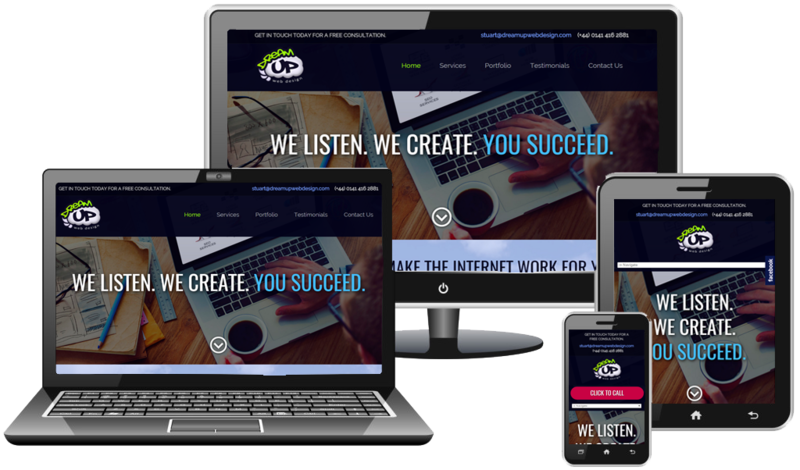 We will build you a high quality website designed to display perfectly on all screen sizes, ensuring a great user experience for all your potential customers regardless of the device they are using. You can expect a stunning responsive website that you, and your customers, will love. Whether you need a single landing page to capture leads, a standard brochure type site to showcase who you are and what you do, or even a fancy e-commerce site, we have the skills and experience to create a unique and engaging website that will capture attention and attract new customers. Single landing pages from £350. 8-Page Business Websites from £750. For more information about our web design services, call us today on 0141 416 2881 or send us an email.